Hillsborough: A watershed moment for Football? The 1980’s. Football, a sport in decline. Attendances falling. Stadiums, little more than metal shacks. Today is a completely different story; the Premier League is a haven of new stadia with families and an overall friendly atmosphere painting a different picture to 20 years previously. But what happened to make this profound change possible. The 1980’s showed a vast increase in football related disasters, coupled with massive decreases in attendances making a football a shadow of its former self. Five disasters in the 1980’s made change essential for the progression of the English game and, coupled with SKY TV, Football arose from its darkest depths in Britain and rose into family friendly, money making entertainment extravaganza. Hillsborough could easily be considered the catalyst because it shocked the whole of Britain into change. Football fans in the 1980’s who were more interested in the game then the fighting were becoming more and more sparse. Fans looking back can recall major problems with terracing, overcrowding for big games and stadium safety neglected. Urinating openly on terraces and objects being thrown are clearly not a problem in this day and age, yet people from the time report these instances happening regularly. One fan reports a Chelsea v Sunderland League Cup semi-final match in 1985, whereby Chelsea fans invaded the pitch to attack Sunderland fans at the opposite end of the ground and an all-out brawl commenced. In todays game, these sort of scenes would be beyond shocking. The Taylor report was a document written that analysed the causes and consequences of the Hillsborough stadium disaster of April 1989, where 96 fans died. The final report was published in January 1990 and alongside looking at the causes and consequences, it looked at what should be changed regarding football in future in order to reduce or stop hooliganism and violence at games. Taylor suggested that a main reason for the tragedy was the poor, or lack of, police control and a main aspect of this is the standing of some fans. Taylor suggested that in future, a significantly higher number of fans should have an individual seat at any football game. As a result of this, new regulations in many, mainly the higher leagues, of English and Scottish football came about. The government, upon reading Taylors report, decided all fans should be seated. Many stadiums were refurbished or rebuilt in order to facilitate for his findings. Taylors report also found that the building of some stadiums was inadequate, mainly the lack of supports and ‘crush fences’, the lack of turnstiles and the influence or presence of alcohol. All of this led to the deaths in this incidence. The Hillsborough disaster had a huge effect on how security measures and staff are enforced at football matches, as seen above in the review of the Taylor Report. 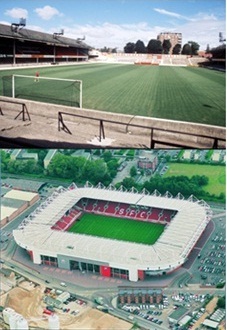 Despite the number of officers deployed at football matches declining after the Hillsborough disaster, from the 1985 total (4,457) to the 1993 count (3,780); the enforcement of the Taylor Report after 1990 led to better stadia structure, meaning segregation of fans was efficient which needed less manning. Comparing the old records to statistics recorded from the 2010-11 season does provide startling results in showing how these new strategies have had a dramatic effect on safety. Compare league attendances of 1993 to the 2011 total; increasing from 500,248 to a staggering 29,459,105, yet the arrest ratio is still 500 personnel smaller. Arrest numbers in Britain had reached their peak by the season of the Hillsborough disaster (1988-89), of 6,175 – the disaster pushed through the need for advanced security, as many signalled policing to be the trigger behind the tragedy. Numbers have near enough been constantly declining to the present day total, obviously displaying positive results of diminishing hooliganism in Britain. By no means is football in a completely safe state though. Though no real disasters have arisen in the aftermath of Hillsborough, clashes still exist of which are of considerable violent nature – as displayed by the West Ham and Millwall confrontation in 2009 and the Birmingham and Aston Villa crowd trouble in 2010; however these are still minor in comparison to previous hooligan related incidents. Disorder is still the main means of arrest in and out of stadia on reflection of recent figures – accounting for nearly a quarter of the arrests (1,408); and alcohol incidents still remain prominent despite tough regulation on match day consumption (1,038). Despite this, Hillsborough can be seen as a massive event in British football history, and a turning point for British football. The introduction of all seater stadia, and the sharp drop in football disasters is no coincidence. Despite being a great tragedy, Hillsborough did some good in that it convinced the authorities that football had to change. Football stadiums are now safe, family friendly places, and football is better for it. Dunning et al., Football and Football Hooliganism, p.5. Dunning et al., Football and Football Hooliganism, p.14. This entry was posted in Making History Project Post. Bookmark the permalink.